As Izzy settles down to life on Bedlam Farm, Jon is amazed that all signs of the troubled rescue dog who first arrived have disappeared. More than this, the Border collie demonstrates an uncanny sensitivity to, and tenderness towards, humans who are troubled or ill.
Izzy's unusual gift leads Jon off the farm and into new, extraordinary friendships, as they together begin volunteer hospice work. Izzy shows Jon what dogs can do for people at our most desperate times. But the work isn't easy, and Jon is reminded that at times he is needy himself. Enter Lenore, a glossy jet-black Labrador retriever puppy, whose seemingly boundless capacity for love reminds Katz why he'd come to the farm in the first place - and why he'd devoted so much of his life to working with dogs. The Dog who Loved is a moving and inspiring story of love, compassion, and the incredibly rich and complex relationships between dogs and humans. 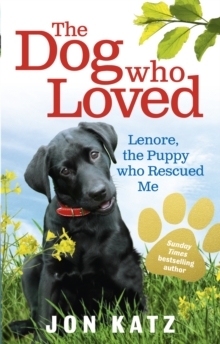 Please note, The Dog who Loved is the UK title for the book published in the US as Izzy and Lenore.